American River College has more than just its students moving on the next chapters of their lives. On Thursday, ARC president Thomas Greene hosted a reception for those faculty and staff members that are leaving the ARC campus and beginning their retirement. More than 30 staff and faculty will be retiring in April and June, culminating in well over 100 years of teaching and service to ARC. “I’ve had 26 wonderful years of interacting with the most amazing students for my many years of teaching,” ARC Patrons award winning professor Gloria Nobles said. The Patrons Chair Award is considered the most prestigious award given to college faculty members. Instead of Greene reading a biography of each retiree’s time at ARC, he went around and asked them each three questions prepared by ARC Public Information Officer Scott Crow: what was your proudest moment at ARC, what will you miss about ARC and what are your plans for retirement? “It’s been an amazing adventure regarding the students,” said fashion professor Diane Grant-Toscano. Many of the them said that they will miss the “family” that they have made while at ARC and that their proudest moments were seeing students that didn’t have any direction go on to become successful. When it came to the plans that they had for their retirement, everybody had something different that they were really looking forward to. Some wanted to travel the world, others were excited to spend more time with their families, some planned to continue instructing things they were already doing outside of class and some were only retiring from ARC but starting jobs in other fields. History professor and ARC Patron award winner Dolores Delgado-Campbell plans to become a English to Spanish counselor for Hispanic women in domestic violence situations. President Greene ended the reception with a speech thanking all of the retirees for their service to ARC and its students over the years, and wished them well for the rest of their lives. 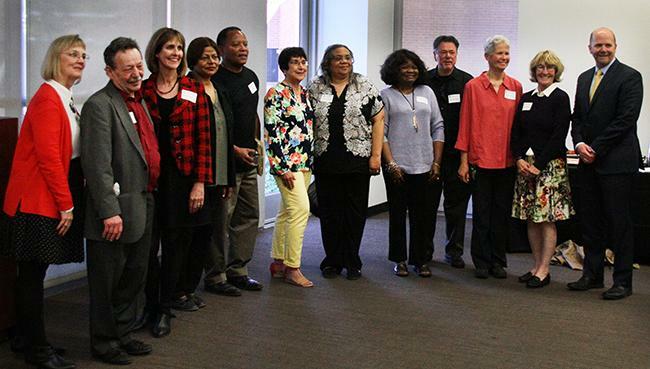 Be the first to comment on "Retiring ARC faculty and staff honored"